Escape Rooms offer a group the opportunity to get participants working as a team to solve clues in order for them to "exscape the room". It is fun and has elements of team building, solving puzzles, and of course working the clues to ultimately be able to get out of the room. Escape rooms typically have varied methods of puzzle solving from codes, to clues that will lead you on an adventure around the room with a purpose of solving a final puzzle to complete the room. We have 4 different rooms to choose from for your event. We have the Ancient Ruins room which has a difficulty level of advanced. The goal is release the golden lion from his cage. A second excape room theme we have is Fortune Teller room which has a difficulty level of advanced as well. 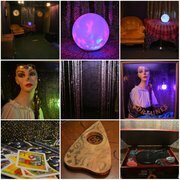 The goal in the fortune teller room is to capture the crystal ball from the Fortune Teller and release the curse on the room. The 3rd Escape Room is a Creepy Nursery Themed Room that has a beginner difficutly level. The Creepy Nursery Room goal is to open the toy box to release the lock. 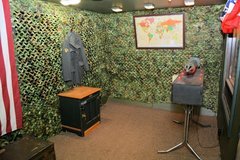 The final room is a Military Room that has a beginner difficulty level. The Military Room goal is to disarm the missle. Ancient Ruins and Fortune Teller are 30 minute rooms. 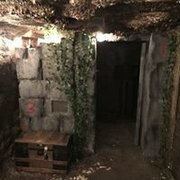 This allows for participants to take up to 30 minutes to solve the clues and escape the rooms. The Creepy Nursery and Military Room are 15 minute rooms. These are shorter rooms due to the difficulty level being beginner. The room times are always varied on the skill of the participants solving each room. You may have some teams go through a room and solve it quickly while others take the full time to solve the room. The goal is to have the participants working together to solve the rooms and therefore having a lot of great minds working on the common goal of the escape.